The chakras of the earth are perfectly aligned with our own. As she awakens, so do we. In the same way we have energy bubbling up from the lowest chakra, called Mooladhara in Sanskrit, or simply the root chakra in each of us which is striving to reach the crown, so that all of humanity can become “enlightened” – so too, the earth herself is participating in this process of awakening. The energy of Mt. Shasta is considered primal and base. This is where the universal life force accumulates before it becomes life – and is representative of the geysers which rush to the surface with energy the same way that kundalini energy is thought to rush to the crown to enliven the pineal gland – where all-seeing spiritual vision thus ensues. The Plumed Serpent – found in many South American myths, it is representative of the kundalini energy rising to the sexual chakra of the planet. Also called the rainbow serpent, this center has some of the most ley crossroads or ley lines on the planet, second only to Bali. It is where our primal energy starts to ‘birth’ itself, quite literally into form. Some say that it is through this chakra that the earth overcomes entropy. This huge, monolithic rock is in the Northern Territory of Australia. This is where dreamtime legends arise from the Aboriginal peoples. Anangu life revolves around the Tjukurpa (sometimes wrongly referred to as the Dreamtime). To the Aboriginal people, this is the ancestral period of when the world was being formed. Kata Tjuta is considered Uluru’s sister rock formation. In us, the solar plexus is where we digest emotion – on the planet, it is where we will one day realize a legend told by the Aborigines from the ‘umbilical chord’ of the planet. This is the home of the holy grail. It is perhaps also our greatest contribution to ourselves and our fellow sentient beings on this planet – to open our hearts to heal the earth and allow her to embody her rightful place as a peaceful, loving satellite in space. Interestingly, this is an area known for high levels of crop-circle sightings which exhibit magnetic abnormalities. 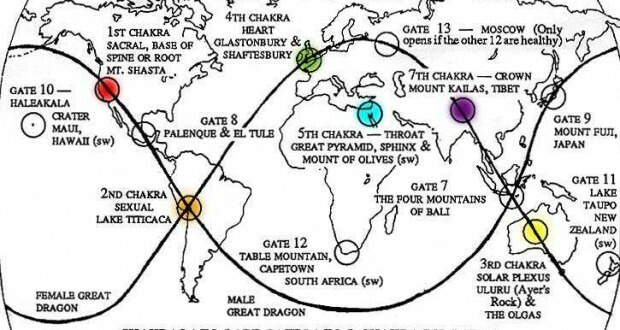 This is the one chakra that does not exist at a ley line. It is the exact center of the earth’s land mass as it currently is configured. Modern day turmoil in the Middle East is considered to be “the cries of the mother” or the voice of the planet calling for help. This chakra can shift – it is called the Aeon activation Center. Now it is considered to be in Western Europe, but will likely move over the next several thousand years. This chakra is the one that opens portals and allows extra-dimensional energy to enter this world. Just like our pineal gland allows us to recognize other dimensions and realities, so too does the 6th chakra of the earth. The highly developed consciousness of Tibetan people, as evidenced through the Dalai Lama’s teachings, is indicative of the energy that resides at the crown chakra of the planet. Just as our own crown connects our will with Divine will, so does Mt. Kailas connect the planet with her spiritual destiny. Matias de Stefano is considered an Indigo child with vast spiritual knowledge. He talks about everything from becoming an evolved civilization to how our brains unite with our Cosmic Memory (otherwise known as collective awareness or the Akashic Records) and how off-planet beings have been trying to assist humanity to evolve. He also explains the earth’s chakras very well. It has possibly never been more pertinent for us to understand this process of spiritual awakening, and more importantly, how this floating blue and green marble in space is so inextricably connected to that evolutionary process, than it is now.